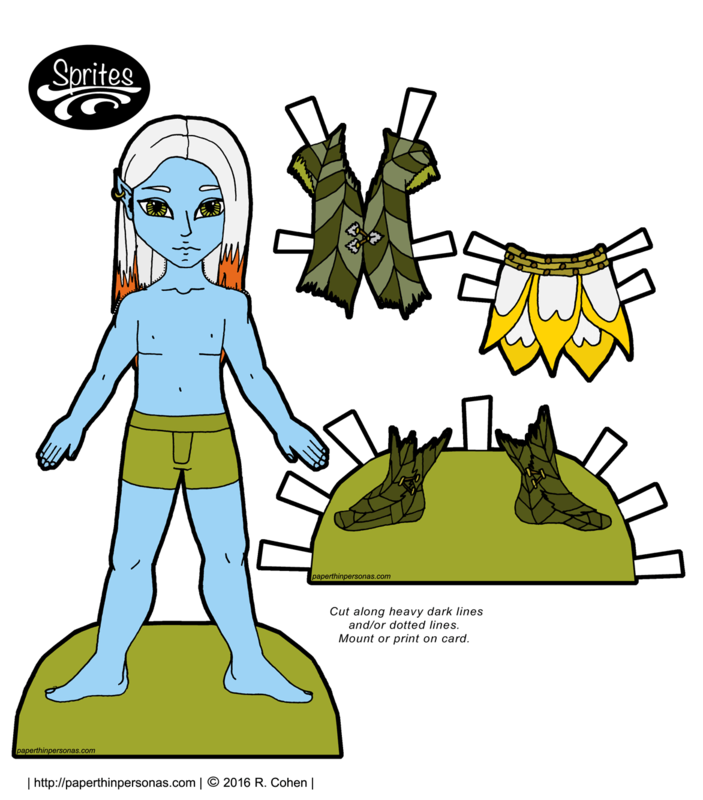 Week before last, I showed off some flower fairy outfits for the Sprites paper doll series. I didn’t have the flower fairy paper doll Sprites done quite yet, but here they are now making their debut. Yesterday, I showed off Yumiko as a fairy and today, I am debuting Xavier, blue skin and all. Xavier and Yumiko are modeling these flower fairy paper doll looks and you can find more paper dolls with those same faces as Xavier and Yumiko, if you want them. Just like with Yumiko’s fairy version, I tried a few different skin colors, before I settled on the blue color. It reminded me of the color of the summer sky. I do worry that he looks a little girly, both because my male paper dolls always feel a little effeminate to me and because the whole flower fairy theme tends to lend itself to a more girly look anyway. Still, I tired to keep him a bit buff with his boots and jacket and kilt made from petals. In my head, flower fairies are just the size of a deck of cards and could fit in the palm of the hand. How do you imagine flower fairies? Tell me in a comment. Love the blog? Become a patron and get extra content and behind the scenes action. I always imagined fairies the same as you, the size of a deck of cards or smaller. I did always imagine them human skin tone colored, though I love the purple and blue (and other fairies you’ve done). I’ve known too many Scottish men to think long hair and kilts look feminine. I think I’m just always nervous that my guys look too girly. likewise with Lina ~ there’s nothing especially effeminate here to me! i love the flame-tipped hair and those boots (of course!). i think he’s awesome! Thank you. By the way, didn’t you promise me historical men’s clothing book recs? She said, hopefully.